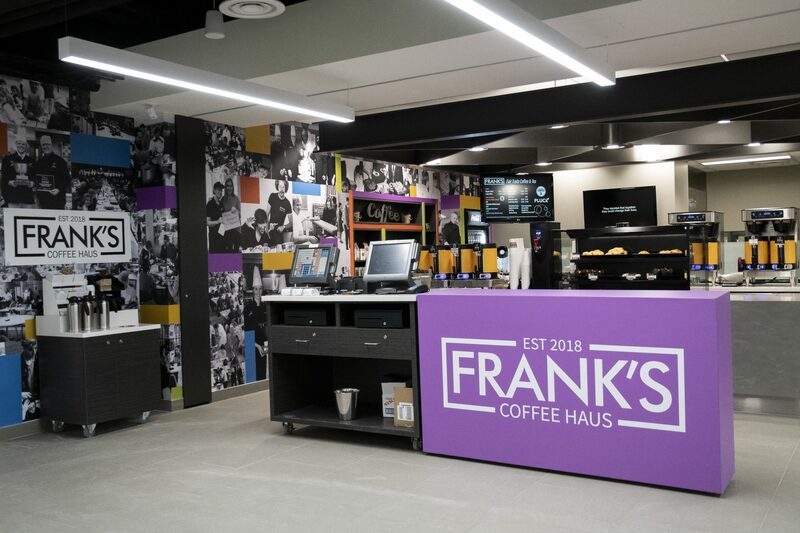 On Friday, Feb. 1, Laurier Food Services launched their latest initiative of on-campus dining with the opening of Frank’s Coffee Haus, located inside of the newly renovated Peters building. Frank’s Coffee Haus is one of the many distinct, Laurier-exclusive places to eat on campus; it is joining the family of Veritas, Wilf’s and Byte 75 as one of the places you can only find on Laurier’s Waterloo campus. “We are excited to now have Frank’s Coffee Haus open to serve the Laurier community. With the new modernized and refreshed Peters Building, our goal was to offer a unique destination within the building to service the students, faculty, staff and visitors on campus,” said Corrie Bird, marketing and communications manager for Laurier Food Services in an email statement. Frank’s Coffee Haus was opened on the second anniversary of Laurier becoming a fair trade campus, meaning that on campus cafés and restaurants serve 100 per cent certified fair trade coffee. Before the renovations, the Peters building was home to a second Tim Hortons™ on campus, the first — and now only location — being the store that still exists in the Science building. The renovations, which took almost a year to complete, saw the building become more modernized and gives a new space to many services on campus, offering extended spaces to other buildings on campus. “It’s homegrown, so these brands you’ll never find them anywhere else. There’s no other Byte 75 and there is no other Frank’s Coffee Haus, so they are original to Laurier and that is kind of what we want to bring to it — that community feel — to a location,” said Nicolette Tsafantakis, marketing coordinator for Laurier Food Services. Frank’s Coffee Haus serves Planet Bean coffee, roasted in downtown Guelph and is not only fair trade certified, but organic. Laurier also offers opportunities to other local coffee shops, like Settlement Co., who have had their coffee served at Byte 75. “Since we saw the success of Byte 75, we thought why not bring another concept where students are going to be proud to visit the actual location,” Tsafantakis said. The physical design of the new campus eatery was influenced by the renovated Peters building itself, not just the name. “There’s a few detail elements you’ll see when you first walk into Frank’s, as we incorporated features architecturally in the building into the design. All the colours of the stairwells in Peters are incorporated into the logo,” she said. “We also incorporated the lighting in the middle of Peters in behind the logo as well, which is the circle lighting. We’ve taken elements of the actual building to make the logo, originally it was a lot of black and white, but we wondered what we could do to incorporate some colour,” Tsafantakis said.